When I first meet with couples about their engagement sessions, I always recommend choosing a location that is special to them. You may be able to search on Pinterest for many picturesque places to shoot, but I always recommend going where the memories are. If you pick somewhere that you both spend a lot of time together, you’ll be able to relax, have fun, and capture special memories of where it all began. The photos will have even more meaning and value many years from now. 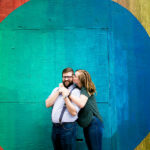 Carlotta and Austin chose to start their engagement session at Quacks 43rd Street Bakery and coffee shop in Hyde Park where they’ve had many dates to unwind together and catch up after long days. The little tables, blue coffee mugs, and custom engagement cookie (the half-eaten #baehumbug photo) were all so charming and had the perfect details to portray a little of who they are as couple. These photos tell part of their love story. Next, we headed out to the Elizabet Ney Museum grounds. It was a chilly winter day, but they warmed it up fast. I loved their cozy holiday outfits! The photos here had a more romantic, intimate feel with all of the alcoves surrounded by greenery and stone paths. Carlotta looked stunning in her cream-colored sweater against the darker green backdrop. They are such a beautiful couple – inside and out – and it was easy to capture their sweet relationship with each other. They both naturally fell into a groove in front of the lens. I can’t wait to see this amazing couple tie the knot in just a couple short months (Memorial Day weekend!) at the Four Seasons! See you soon, friends!